Do you cook to eat or do you cook to live? Creating culinary delights is as necessary to you as the air you breathe. Becoming a chef is the dream you plan on chasing. Once you get your degree in culinary arts, your available options are endless. But, what does it take to become a chef? Read on to find out more about culinary school and chef careers. If you've already gotten your degree, find out about culinary arts advancement opportunities. Find a local culinary arts college. Maybe you worked in a restaurant, or you helped your parents with dinner. Somehow, some way, you found your passion in the kitchen. And now? You want to be a professional chef. Life would be easy if you could just snap your fingers and viola, you’re working over a hot stove in a fancy cosmopolitan restaurant. Unfortunately, it doesn’t work that way. You need to start thinking about what you want to be while you’re still in high school, and sometimes, even younger. Once you’ve gotten your high school diploma, or your GED, then you can start on your culinary education journey. Depending on which program you choose, culinary school will take one to four years to get your diploma, associate’s, or bachelor’s degree. Culinary School: Culinary school focuses on all things culinary. Going to culinary school, despite the higher cost, is the best option when you want to work in the food industry. You can get a diploma through a degree at culinary schools. It can take one to four years, depending on which degree you’re working towards. Community College: While the culinary program at a community college will focus on culinary, you’ll also have to take general education courses. This path usually takes two years if you attend full time. Through a community college, you’ll get an associate’s degree. Vocational/Trade School: Vocational/Trade schools are generally the quickest route to take to get working in the trade quickly. This can take 9-21 months but it depends on which program you attend. Vocational school graduates will get a certificate or diploma. University: At a four-year university, you’ll receive a bachelor’s degree. You’ll be equipped to handle the business side of culinary, as well as working your way around a kitchen. 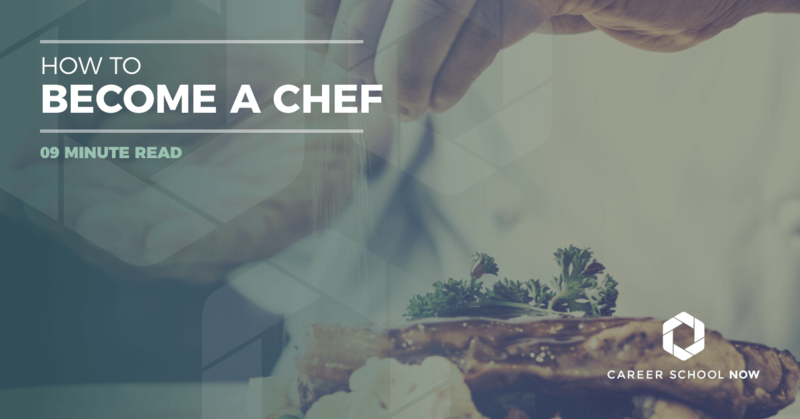 Check out our FREE chef certification practice tests! There is a definite distinction between a chef and a cook. A chef is a master of culinary arts through extensive training. A cook, although highly trained, will usually work under a chef. Under the blanket heading of CHEF, there are quite a few career options worth mulling over while you’re figuring out what you want to be when you grow up! Executive Chef: Is the head honcho in the kitchen. This position could take decades to achieve but with the right education, dedication, and perspiration, it can happen. Sous Chef: Is the executive chefs right hand man. It’s the Robin to the Batman. The yin to the yang. They are usually placed in charge of micromanaging the kitchen and making sure everything, from the relationships amongst the kitchen staff to the preparation of the food, is running smoothly. Pastry Chef: Baking school is the first step in becoming a pastry chef. Breads, desserts, pastries, those are all the drool-worthy fruits of your labor. As a pastry chef, you can still become an Executive Chef. Station Chef: Whether it’s soup, salad, grill, as a station chef, you’re in charge. You’ll work under a sous chef and be in charge of presentation of whichever station is under your watchful eye. Saucier: The sauce is what makes or breaks the food. In some cuisines, such as French, the meal is all about that sauce. So, while the title “saucier” may not necessarily sound all that fancy, it actually is! Fish Cook: You really CAN mess up a good piece of fish. But, not you, Fish Cook. You’ve trained and studied and you can wow the patrons with delectable delicacies of the sea dwelling kind. Vegetable Cook: We love our veggies, potatoes, rice, and eggs. That’s where you find yourself excelling, as well. You can take one look at vegetables and turn them into a drool-worthy dish that complements the main course perfectly. Meat Cook: Meat cooks deal with the, well, meat of the meals. Whether you’re grilling, broiling, braising, or roasting the meat, you do it with gusto. You may hook up with the saucier to create a sauce, and the vegetable cook to conglomerate on a side dish. Fry Cook: Fried foods are your thing. Positions may be more plentiful in areas where fried foods are more popular, such as down South. Pantry Chef: Are in charge of the cold items such as appetizers, salads, and dressings. You’ll also make sure the plates are presentable before they are served to the customers. Line Cook: The Line Cook is an entry-level position. Basically, you’re the right-hand man to everyone in the kitchen. You’re helping stir, chop, and maybe even taste all the foods beings created. Expediter: When it comes to foods and kitchens, the expediter is the last line of defense before the plates are taken from the kitchen and presented to the customer. Sometimes, this position is even taken over by the Executive Chef, especially during occasions when the dish is extra special and the pomp and circumstance is required. Between now and 2026, employment opportunities for chefs is expected to grow ten percent. This is a bit faster than most other occupations. The average rate is five percent so this is actually great news for you aspiring chefs. Driving the employment rate growth is the fact that incomes are rising, along with the population. Essentially, people have more disposable income and are willing to spend it on quality meals. Also, trends are pointing toward healthier meals because the general public is becoming a bit more aware of what they are putting in their mouths. Farm-to-table restaurants, along with locally grown and organic, are popping up everywhere and these places look for chefs with an original vision who can create culinary masterpieces. Expect strong competition in more upscale restaurants in places like hotels, resorts, and casinos. If you have mad creative culinary skills and a strong business acumen, you should have no problem landing a great job as a chef. The average median salary for a chef or head cook is $43,180 according to the Bureau of Labor Statistics. Salary.com states that the average salary for an Executive Chef is $62,584. The bottom 10 percent, generally more entry level, will earn a yearly median salary of $23,630 while those in the top 10 percent will earn an average of $76,280 per year. These numbers are only an average based on all recorded salaries. Keep in mind that salaries are dependent on which state you work in, and who your employer is; your salary may look very different than what is listed. Most schools have different course requirements, or they may go by different names. Below is a chart listing some of a few common courses for each type of the three most popular culinary degree types. When it comes to culinary schools, it seems like the options are limitless. So many out there that it can be hard to weed through. Sure, factors such as location and price can make your answer clearer. But, there are a few things to look for, aside from the obvious, when researching culinary schools to attend. Is the school accredited? With the American Culinary Federation, which is the organization in charge of culinary school regulations. How long has the school or the program been around? The longer, the better. Because, if a school has been around for a long time, that is usually indicative of quality. Is there hands-on instruction? You can learn the basics from a book but true experience comes with actual practice. Cooking, in any form, is an action and you need to make be certain that hands-on is part of the curriculum. Does the school have any famous alumni? Not that it matters because hey, you could be that person someday. But, it gives a definite check in the pro-column if the school has bragging rights to famous chefs. Is the school connected? Can they offer job placement upon graduation? Do they partner with restaurants for that paramount hands-on instruction time? Very important to find out this information. That first job, post-grad, comes much easier if the school has connections to help their graduate students. What's the difference between an associate's degree vs. culinary arts certificate? To work as a professional chef, there are no certifications necessary aside from your degree or diploma. However, there are some available licenses which are strictly voluntary. While licenses are not required, they can add a bit of posh to your resume. Certifications must be renewed every five years to keep them current and valid. The American Culinary Federation offers certification exams to chefs who qualify, and each of their exams have different qualification requirements. What their exams will prove to potential employers is that you’ve achieved a certain benchmark, an unparalleled skill set that makes you a great catch. The ACF offers 14 different certification exams. To even be eligible for the first exam, the Certified Culinarian, you must have either already received your associate’s degree or have worked two years in the industry. There are 3 30-hours courses you must take before sitting for any of these exams. The ACF also offers more advanced certifications, as well. The Culinary Institute of America offers a ProChef Certification. There are three levels to this intense exam, all of which test you on your proficiency and expertise in every part of culinary arts from the kitchen to the business side of the industry. The ProChef certifications are considered to be one of the most highly regarded in the industry. Certification exams are also available through the United States Personal Chef Association, and the Research Chefs Association. The USPCA requires a membership first in order to be eligible to take their certification exam. The Research Chefs Association offers certification for areas such as culinary science, and research chef.